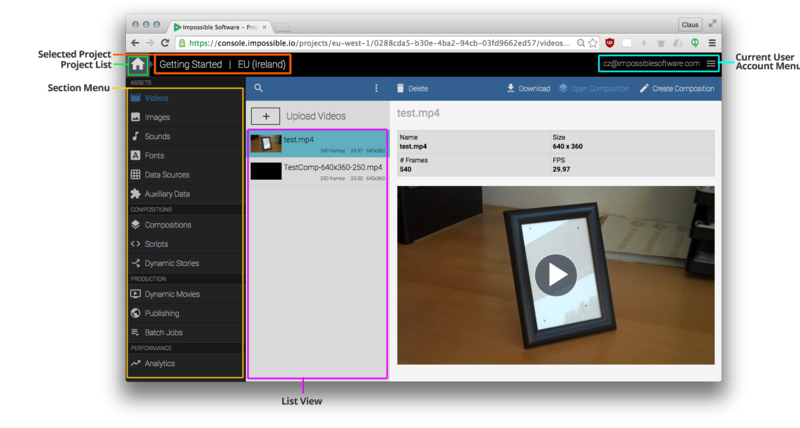 The Project Management Console is a web application for managing and working with Impossible Software's ImpossibleFX Video Personalization Platform. The Console provides an intuitive user interface for performing many tasks, such as creating and managing projects, uploading assets, creating movie templates, scripting and working with dynamic stories. The console also provides access to your account settings, such as your passwords, billing information and usage reports. To access the Project Management Console, goto https://console.impossible.io.